Internet access is increasingly available on public transport, in parks, and in colleges and universities. Russia has a population of 147 million people, 57 million of whom are internet users. According to data from 2010, one in three of those 57 million uses their mobile phone or another mobile device to connect to the internet, making 19 million people potential subscribers to a service which would connect them to a free Wi-Fi network. Most of these 19 million are concentrated in cities with populations of over one million people. 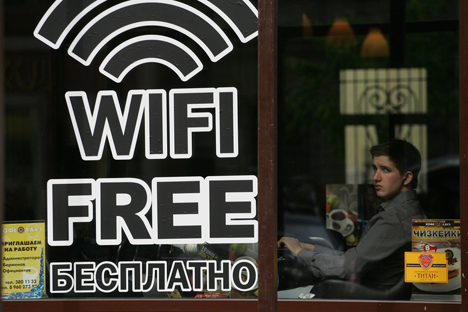 And it is in these cities that the market for free Wi-Fi services has been burgeoning in Russia’s since 2011. According to data from wifi4free.ru, Moscow has the most Wi-Fi hotspots of any Russian city with 1413, of which 1178 are free (leaving 235 paid). The capital owes its position in no small measure to its well-developed network of restaurants and hotels, even though other cities’ free Wi-Fi is concentrated primarily in service establishments as well. There are, however, other areas where free Wi-Fi has spread, such as in educational institutions, public transport, and green areas – parks, squares and other open, public spaces. The Moscow City Government began testing Wi-Fi on buses and trolleybuses in July 2011. Today, free internet access is available along several routes between Zelenogorod and Moscow. It was originally launched as a six-month project, but by the end of the original timetable, plans had been set to ensure free internet access on all of Moscow’s buses and trolleybuses, though the project has not yet been finished. But in other cities, free internet access on ground transport has been expanded. Mobile operator MTS is developing a Wi-Fi network in Russia’s Ural, Siberian, Volga, Northwestern and Central Federal Districts, providing bus, tram, trolleybus, taxi and suburban train passengers free access to their 3G networks. MTS’s main competitor in the market for equipping these vehicles in Russia’s cities with Wi-Fi is Beeline. “Projects for providing Wi-Fi on public transport are being carried out in Murmansk, Kaliningrad, Petrozavodsk, and St Petersburg, where we have equipped Wi-Fi routers on more than 300 vehicles in total,” Beeline spokeswoman Anna Abasheva said. In most cases, the conditions upon which city administrations agree with service providers do not bring in a profit; companies set up free internet access on public transit at their own expense, and in return they receive free advertising space on-board. Another ambitious public-transport WiFi project is that of ensuring free internet access in Moscow’s underground system. This undertaking demands especially serious investments from the service provider(s) who would prepare and maintain it; estimates vary from 1.6 billion roubles (almost $50 million) to 7 billion roubles (over $216 million), prices potential investors are in no hurry to pay. The auction for setting up Wi-Fi across the city’s underground system has been postponed twice already: the first one began on December 21, 2012 and was supposed to end on January 15 this year, but the closing date was extended to January 28, and then to February 4. But when the auction did close, not a single offer had been submitted; the media cited low potential payoffs in the face of exorbitant costs as the cause. An Interfax source in Moscow’s transportation industry reported that a new competition for setting up Wi-Fi in the metro will be held on July 26. The winner will have to have Wi-Fi running on the ring and Kakhovskaya lines within 21 weeks of the day an agreement is reached. Officials promise free Wi-Fi in all metro stations within a year. Interestingly enough, MTS has already had success in equipping a subway system with Wi-Fi: the service provider has already set up wireless internet access on (albeit four out of 14 of) Nizhny Novgorod’s metro stations. Fourteen of Moscow’s parks have free Wi-Fi, and all but Gorky Park (whose Wi-Fi is run by the company Yota) have been equipped therewith at the city’s expense. Megafon runs its own free networks in parallel with the city’s in 12 of the parks. Projects for setting up free Wi-Fi in open spaces are being carried out in other regions as well. MTS offers free Wi-Fi at ski resorts in the Sakhalin and Novgorod regions. The city of Oryol’s administration covered the costs of setting up routers in two city parks; this year there should be free Wi-Fi in several squares in Ufa; and in Tyumen, a free Wi-Fi network consisting of 54 hotspots was unveiled all at once. The hotspots are located in popular locations throughout the city: railroad stations, public squares, by sport and recreational complexes, and health and educational institutions. Proponents are lobbying for free Wi-Fi at Russia’s educational institutions at the federal level. Twenty-five percent of Moscow’s secondary educational institutions currently have their own Wi-Fi networks, and by the next academic year, all of its schools should have free Wi-Fi. MGTS (Moscow City Telephone Network) has a two-year contract for equipping Moscow’s primary and secondary schools with Wi-Fi networks, as well as for filtering content by limiting student access to sites with illegal and adult content. The capital is also considering equipping its universities and institutes with Wi-Fi, with the costs coming out of the municipal budget. Moscow mayor Sergey Sobyanin promised that free Wi-Fi could be ready in the main buildings of Moscow’s universities in as little as two years. Some Russian regions are solving the problem of installing Wi-Fi in educational institutions by attracting communications providers. For example, VimpelCom took it upon itself to set up Wi-Fi in several colleges and universities in Ulyanovsk and Nizhny Novgorod. In Nizhny Novgorod’s case, however, free internet access was included only for students who use Beeline.